Unusual Signs Of Gout can lead to poor diagnosis. Because if your symptoms do not match typical gout sufferers, you might not be diagnosed with gout. Unfortunately, that can lead to serious treatment delays. So be sure you understand these unusual signs of gout. Then if you have any of these symptoms make sure your doctor arranges thorough gout tests. I wrote Unusual Signs Of Gout for Arthritis Sufferers who are not sure if they have gout or something else. 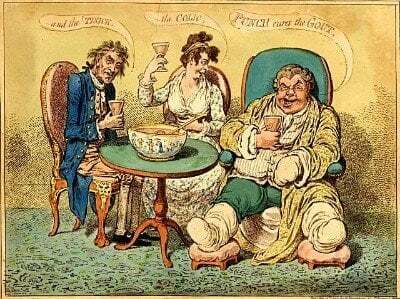 But if you are not sure what type of gout person you are, read Questions for Gout Sufferers first. Gout is usually recognized by intense pain with inflammation. But other unusual signs of gout include skin discoloration, tingling (pins and needles), and numbness. Gout is frequently assumed to mean a big red swollen toe. So, discoloration is the least unusual of these signs of gout. But, that redness occurs during most gout attacks in any joint. Also, the skin discoloration is often described as purple or “bluish”. Leading to confusion between gout discoloration and bruises. Does your skin get discolored during gout attacks? Several GoutPal members have complained about pins and needles, or tingling, in gouty joints. Now, this is backed up by several studies that link gout with these tingling sensations. Note, this is not as common as numbness which I describe next. But there are over 6,000 gout studies asociated with tingling and/or pins and needles. Of these, over 1,500 refer to pins and needles. There are over 9,000 reports of numbness linked to gout. So this is quite a small percentage from the millions of cases of gout. But it is significant. In some reports, numbness is thought to be caused by suspected gout. But tests and examination reveal the cause to be something other than gout. So this highlights the importance of consulting a gout-experienced rheumatologist. 2. Uric Acid Deposits Pressure. Many cases involve uric acid deposits. Because these will grow and might put pressure on nerves. So gout often causes secondary diseases such as Carpal Tunnel Syndrome, where numbness in the fingers is common. Most cases report numbness linked to gout. But without specific explanation. As you can see, there are 3 unusual signs of gout. Apart from discoloration, these are rarely considered. So you might not get the correct diagnosis at first. But there are blood tests and other tests that doctors can use to confirm gout. Therefore, you should get tested for gout if you notice discoloration, tingling, or numbness in or around your joints. If you are not sure what to ask your doctor, we can advise you in the gout forum. Similarly, use that forum to tell us your doctor’s advice if you need help understanding it. Leave Unusual Signs Of Gout to browse the Gout Symptoms Section.